Acantharia (Radiolaria) are widespread and abundant heterotrophic marine protists, some of which can host endosymbiotic eukaryotic microalgae. 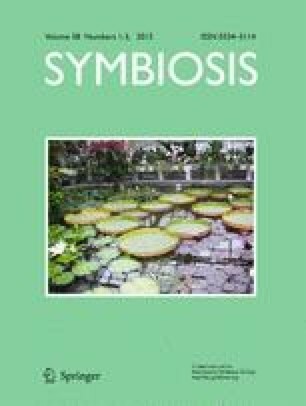 Although this photosymbiotic association was first described at the end of the 19th century, the diversity of the symbiotic microalgae remains poorly characterized. Here, we examined the identity of the microalgae associated with the acantharian species Acanthochiasma sp. by sequencing partial 18S and internal transcribed spacer (ITS) ribosomal DNA genes from cultured symbionts and directly from isolated holobiont specimens. Single Acanthochiasma cells contained multiple symbiotic partners, including distantly related dinoflagellates (Heterocapsa sp., Pelagodinium sp., Azadinium sp. and Scrippsiella sp.) as well as a haptophyte (Chrysochromulina sp.). This original association of multiple symbiotic microalgae within a single host cell raises questions about the specificity and functioning of the relationship. These microalgae exhibit the common ecological feature of being abundant and widely distributed in coastal and oceanic waters, some occasionally forming extensive blooms. Some of the microalgal genera found in association with Acanthochiasma (i.e. Pelagodinium and Chrysochromulina) are known to occur in symbiosis with other heterotrophic protists such as Foraminifera and other Radiolaria, whereas Heterocapsa, Scrippsiella and Azadinium have never previously been reported to be involved in putative symbiotic relationships. The unusual association unveiled in this study contributes to our understanding of the ecological and evolutionary significance of photosymbiosis in Acantharia and also provides new insights into the nature of such partnerships in the planktonic realm. The online version of this article (doi: 10.1007/s13199-012-0195-x) contains supplementary material, which is available to authorized users. We thank the Laboratoire d’Océanographie de Villefranche-sur-Mer (LOV) for providing sampling facilities and Morgan Perennou and Gwen Tanguy from the GENOMER platform at the Station Biologique de Roscoff. This project was supported by the network “Bibliothèque du Vivant” funded by the CNRS, the Muséum National d’Histoire Naturelle, the INRA and the CEA (Centre National de Séquençage). This research was supported by the Region Bretagne (DIPHOPE 044763), the JST-CNRS program, and the EU FP7 I3 project ASSEMBLE and KBBE project MACUMBA.